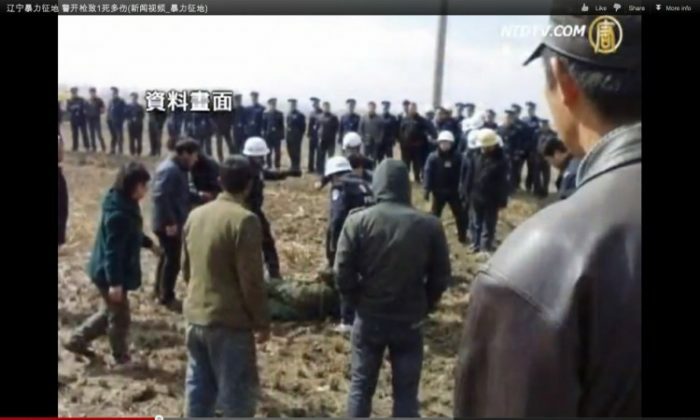 A Chinese farmer who for years fought attempts by local authorities to confiscate his home and farmland for real estate development was shot dead by the police recently. He was unarmed. The incident took place in Ershili village in Panjin, Liaoning Province. 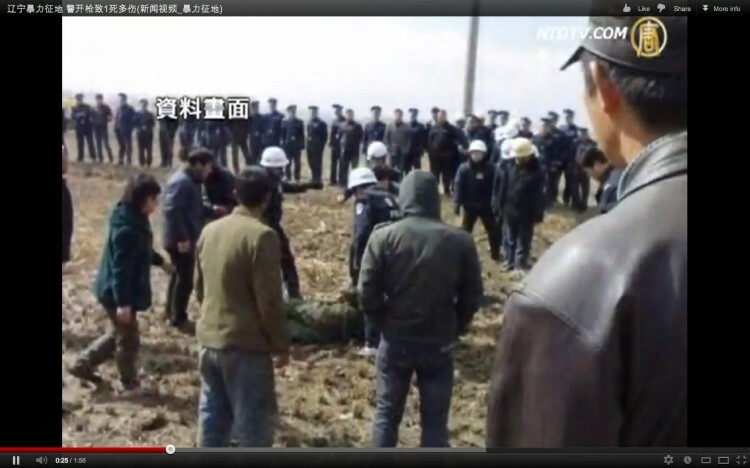 The mother and father of Wang Shujie, the farmer who was killed, were also injured in the attack. According to a witness who would not be identified, on Sept. 21 a man named Zhang, a local “leader,” or official, who controls a number of farms in the area, led about 100 people from the Urban Management Office, brought an excavator and had plans to dig up Wang’s crop field. Wang resisted, and an argument broke out. Police from Panjin City’s Bohai police station then came to the scene. By 10:30 a.m. the situation was “almost out of control,” according to a resident. The police began shooting. The first bullet went through Wang’s father’s knee; another shot hit his mother in the arm; as Wang tried to protect them he was shot in the chest and died instantly, the witness said. “They fired quite a few times. We couldn’t believe how the policemen dared to shoot them in front of so many people!” the witness said. After he was killed, a large group of police removed his body. His wife was also arrested, leaving the two children, of three years and three months old, to the care of others. “The miserable child was crying for milk. We feel so bad for the baby that we cried as well,” the witness said. Wang Shujia’s brother, Wang Shulong, was also at the scene, and his movements have now been restricted. Wang’s parents were sent to the hospital, where they are not allowed to meet people freely, a resident said. After the shooting, the local government began an attempted coverup. A policeman at the local Bohai police station Xinglongtai District, Panjin City, denied any knowledge of the shooting. Other government representatives hung up the phone when reached by reporters. Residents interviewed said that the Wangs had been targeted for expropriation for some time, despite appeals to authorities to block the process. The killing, and the way the authorities covered for the police, sparked a storm of rage online. News about the matter was viewed tens of thousands of times and forwarded thousands of times on Sina Weibo. Liang Wendao, a well-known journalist and writer in Hong Kong, said that according to his sources the deputy mayor of Panjin City, Jiang Weihua, effectively ordered Wang’s death. Jiang is also head of the local Public Security Bureau. According to Liang, he said words to the effect of: “If he does not cooperate, if he dares to oppose the government, what’s the big deal about killing a few? Shoot! The compensation is only a few hundred thousand, isn’t it? I’ll take care of all that, and the central government doesn’t have the authority to intervene.” The post was forwarded tens of thousands of times. Click www.ept.ms/ccp-crisis to read about the most recent developments in the ongoing crisis within the Chinese communist regime. In this special topic, we provide readers with the necessary context to understand the situation. Get the RSS feed. Who are the Major Players?